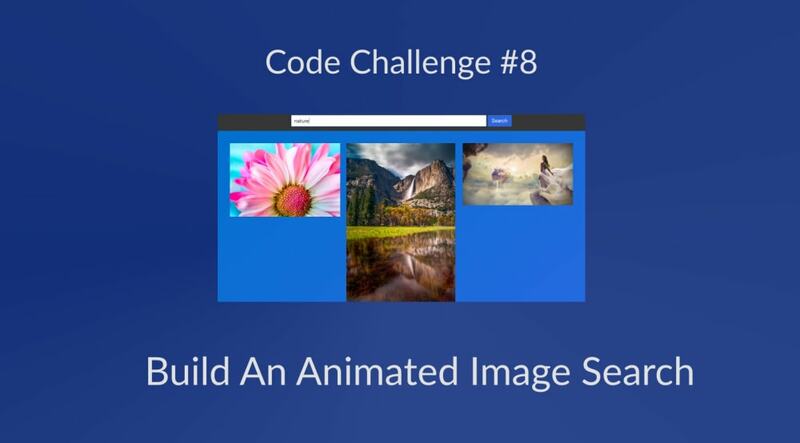 In this week&apos;s challenge, we shall be building an animated image search application. This simple application will have the ability to search for images and return a specified amount of images. We shall be making use of the Pixabay API to complete this challenge. For this challenge, we are required to create a simple image search application with a special feature. This feature requires the search bar to be at the center of the page and once a search query is submitted, the search bar moves to the top of the screen, with splendor, of course I mean it should be animated, lol. The final product should look like this. Notice how the search bar animates to the top of the screen to allow for the display of the images? That&apos;s a key requirement of this challenge. Utilize the provided API to fetch images from Pixabay. Move the search bar to the top of the page once the images are loaded. Animate the movement of the search bar to the top of the screen. Understand and make API calls. Utilize simple animation properties in CSS. These images once fetched are displayed in a collage, however, as a bonus, try to display a single image once clicked, either as a modal, popup or new page, however you like it! A base codepen has been provided as a starting point for completing this challenge.The base code consists of HTML and CSS with the Sass variant. Also, Bulma classes were employed to style the app. Fork this base codepen as your starting point. Interact with others completing the challenge via the Slack Group in the #codechallenge channel. Post your solutions in the comment section of this post. Also, feel free to leave your feedback, reviews and comments in the comment section of this post. The solution to this challenge will be released on Tuesday. Happy coding!